Meet Breakfast Speaker Ron Chew! 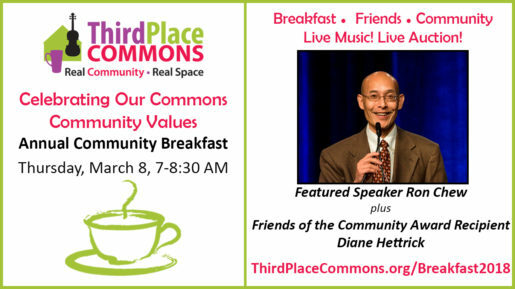 Local nonprofit leader, community organizer, and renowned thought leader Ron Chew will be the featured speaker at Third Place Commons’ upcoming annual community breakfast on Thursday, March 8. 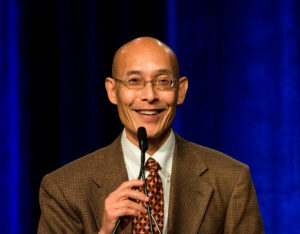 Chew is a nationally recognized thought leader who established himself on the national stage during his 17 years as executive director of the Wing Luke Museum of the Asian Pacific American Experience. During his tenure, Chew led the Wing through a $23 million campaign and the acquisition and renovation of a historical building in the International District, which then became the Wing’s permanent home. Following his success at the Wing, he launched Chew Communications, which specializes in helping cultural organizations to collect stories and oral histories that contribute to a more tolerant and just world. Chew has gained national recognition for his expertise in the role of community-based arts organizations as central to cultivating social justice and fostering healthy communities. He has been recognized with the Ford Foundation’s “Leadership for a Changing World Award” and as part of the American Association of Museums’ “Centennial Honor Roll.” Chew is also a sought-after presenter and keynote speaker at museum and cultural conferences. Since 2010, Chew has served as executive director of the International Community Health Services (ICHS) Foundation, which opened its Shoreline location in late 2014. ICHS brings medical, dental and behavioral care to Seattle & King County Asian & Pacific Islander communities as a nonprofit. The Shoreline location also offers a Young Adult Clinic where low-cost and no-cost services are provided to young patients aged 14-26. In addition to Chew’s remarks, the breakfast will also honor Friends of the Community Award recipient Diane Hettrick, editor of the Shoreline Area News. The community breakfast is Third Place Commons’ biggest fundraiser of the year and is a popular annual tradition. The event will also feature live music and a live auction with a surprising array of fun items. Get information and tickets here. Special thanks to this year’s Platinum Sponsors Merlone Geier Partners, owners of Lake Forest Park Town Center, and Republic Services for their generous support of this event. Third Place Commons is a community-supported 501(c)3 nonprofit organization dedicated to fostering real community in real space by hosting over 900 free events each year, presenting the Lake Forest Park Farmers Market, and partnering with civic, arts, and social service entities to help maximize their impact. Previous Post: It's Time for Breakfast! Join Us! Next Post: Dance Lessons and More Coming Up at the Commons!